To all my friends, family and artsy friends I would like to wish you and yours a wonderful Thanksgiving. I am thankful for all of you, my wonderful family, my great friends and every day I have to be creative! God Bless and Happy Thanksgiving! I have been working on my Christmas Cards and projects trying to get them finished. With little time to finish my latest large watercolor. I hope to have all my Christmas painting done within the next 2 weeks, because I have 2 more that I really want to start on. I have so many sketches and projects lined up that I will be busy and can't wait to post my progress. The Christmas Show is coming up on December 11th, at Folly Beach. I will post my Christmas projects for sale soon and the link to where they can be purchased. I hope to post the watercolor I just finished with in the next week, so be on the watch!! 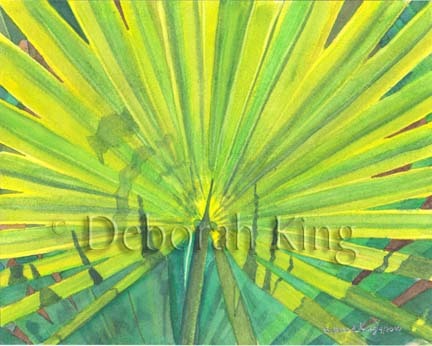 I'm excited to say the "Sunlite" won a Blue Ribbon, my 1st, at the Folly Beach Fine Art Show!!! This is encouraging. Watercolor, you see is a medium I have struggled with for many years. 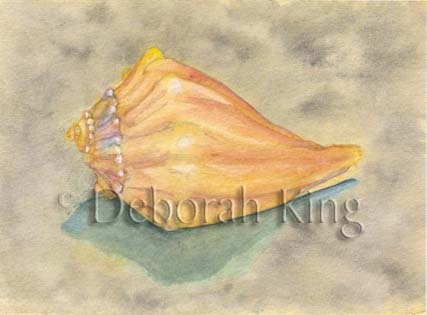 I have always enjoyed watercolor painting, from the lite and translucent to the glazed and detailed. I would look a paintings in books and magazines and wish I could paint like that. Pick up my inexpencive little pad and give it a go. To say the least it looked like mud. Taking classes at this time in my life was a little out of reach, and following the instructions in the How to books didn't quite work out, leaving me frustrated to say the least. Back in the closet they went till the next time. I eventually invested in a small watercolor set of better quality I found on sale. There was some improvement, giving credit to the paint, but nothing I would show to any one. But still enough to start using watercolor as a background wash for some of my color pencil paintings. Then back in the closet they went. Finally this year, I met a new friend on Facebook and when she offered video classes on line, I took them. The first painting was better then I had done in the past, but still nothing to brag about. The second painting was a beautiful Bird of Paridise flower, at least the photograph and the instuctor Julie's painting were, mine looked like washed out mud. We conversed, a few critiques and a helpful suggestions later I repainted the lesson and I haven't stopped painting since. Ok, so I’m not the best at this writing thing, but I’m working on it. It’s been a month since my last post, maybe I’ll strive for 2 weeks next time. I think I need to keep a “to do” calendar for blog and web postings. A gallery page has been started on this blog, with more work to be added soon. I am working on a web page where I hope to have links to all my web postings. My time lately has been spent painting, matting and framing several of my latest pieces, some of which are on display at Eileen’s Restaurant in Summerville. For those in the Charleston, SC area I will have paintings in the Fine Arts Festival on Folly Beach, both in the Judged Exhibition and in a friend’s booth on October 23-24. This will be the first time I have entered my watercolors in a show as I have only been working seriously in watercolors since the beginning of this year. This is the first time in 5 years I have been able to enter any show. NO NERVES HERE, lol. 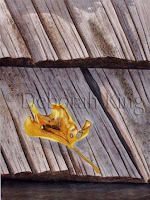 I will also be entering the Coastal Carolina Fair Art Exhibit October 28 - November 6. Hope to be able to announce more shows soon. I have at least been painting almost everyday. Watching videos, reading books and trying new techniques, learning and playing with this medium that till the beginning of this year eluded me. I will say that I learned more from past frustrations then I thought, and the similarities between watercolor and color pencil are greater then I imagined. I have a few color pencil “paintings” in the works, but I must admit they are on the back burner right now. I am enjoying this new found freedom from frustration with watercolor. There are 2 paintings in progress right now that I will show when they are finished. Most of my more recent work (last 5 years) has been in the medium to large size range, at least for me. Ranging in size from 8x10 to 18x24. But I've done a few in the smaller size range, 5x7 down to 2.5x3.5 and smaller. 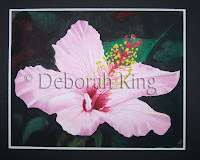 After posting my latest ACEO's a friend inquired about how I learned to paint to small. It was actually just the opposite, I had to teach myself to work large. I've worked with a variety of mediums over the years in the smaller sizes, It just seemed to come natural. So I began to think of what advice I could give her to ease her frustrations. Working in outside of your comfort zone can block the creative process and become as frustrating as wanting to do something and not knowing how or where to start. I offered this suggestion, which I have used on occasion: Use a pencil and draw your picture, just and outline sketch, what ever you are comfortable with to start seeing your design or picture, now get an inexpensive set of markers with a brush tip. 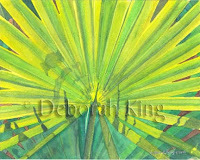 Start "painting" the picture as if you were using paint this way you get the feel of working small, but have a little more control. This way you get the feel of working on the smaller size with a smaller image. Then just adjust the brush size for the smaller image. Color Pencil with a very light tough can be used in place of brush tip markers, you just will not get the "brush " feel. I was often told that I worked small and tight, and that I needed to loosen up. While most all of my pictures start out as a sketch of some sort in pencil, or ink they usually start out no larger the 5x7, the size of the sketch pad I carry with me everywhere I go. I had to learn to translate these sketches into larger images so I bought a large pad of newsprint (not to expensive, since most were going to end up in "file 13", an used a carpenters pencil (large flat lead) or charcoal pencil, and began "enlarging" my work. 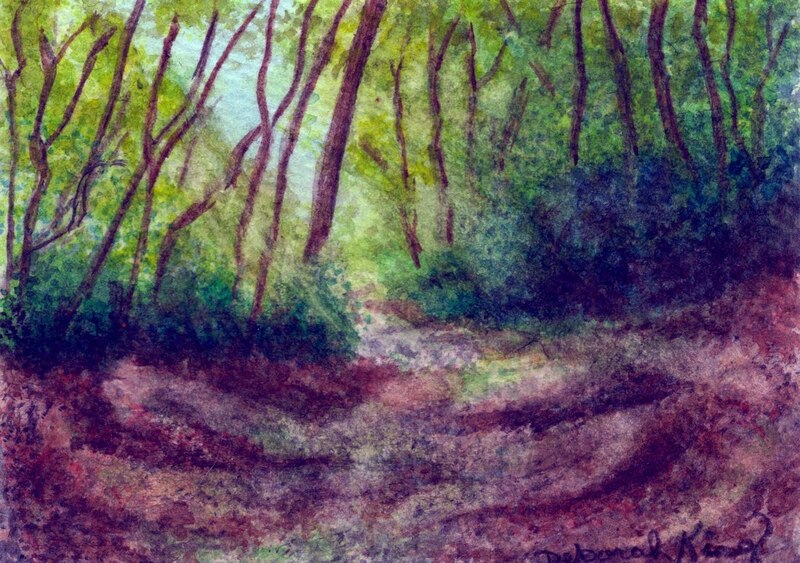 Then my challenge became the elusive WATERCOLOR, but I'll save that for another time. Thank You Pat for suggesting I blog this, sometimes I forget that we all stuggle with the samethings. When you see someone else's work, You see the beauty they created, not the struggles on the path to get there. OK, I forget about the blog when I get busy. The painting I started before our family came to visit is finished. And the photographer who so kindly allowed me to use his work to paint from has seen the painting. I'm pretty sure he was happy with the outcome. Yes, I work from photographs, more now then ever before. Sometimes one photo catches my interest so much that I paint from a single photo, sometimes I use a number of photos as reference, sometimes the photo just triggers an idea and I run with it. I use to take all my own photos for reference, but getting out to shoot isn't always that easy these days. While I have a vast photo library, some are old news, everyone has painted them or they just don't interest me like they use too. I needed fresh inspiration. Thanks to our lovely social networking systems on the Internet, I have recently caught up with a lot of my old friends. One of whom is a professional photographer and photography teacher. After seeing some of his photographs on line I came upon one that I drew my attention. Over the next 2 weeks I caught myself planning the painting, making rough sketches, debating on the size of the painting. But one key factor here was missing. The photographers permission. Forgoing copyright, which by the way is very important, for the personal side of things, I know what it is like to see something I've created being copied or out right used without permission. After contacting Kenny, and receiving his permission to use the photo as reference, the rest is in the picture! 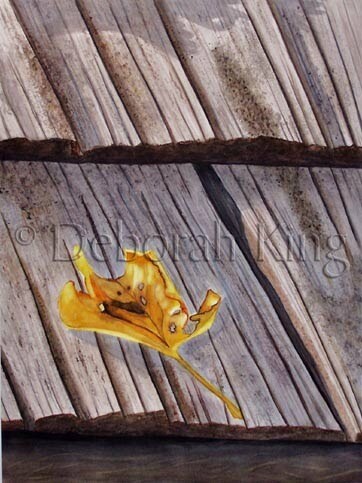 "Autumn leaf on a cabin roof"
http://www.kennymckeithanphotography.com/ . Stop by and check out some of his work! It's been a wonderful 2 weeks with family from out of town. But, it's time to get back to painting!!!! Right before they arrived, I started a new painting, however my studio and guest bedroom are one-in-the-same so painting stopped. I found time for sketches for upcoming paintings, all the while the watercolor I started has been calling my name. Our visitors had a 12 hour drive when they left us Monday morning and we had things that needed to be done, in between travel progress calls. By Monday late afternoon, things had slowed down and something started calling my name again. PAINTING has begun and family is now home safe. Teasing has begun, my husband said he could hear the painting calling my name and wondered how long it would take for me to start. I have spent the day catching up on emails, housework and my PAINTING!! While waiting for the large areas to dry, new paper has been stretched for my next 2 paintings. The sketches I worked over the past 2 weeks will become paintings now. I will be painting a new palm similar to Sunlit and I'm still trying to decide on the 2nd one, but the paper is ready!!!! Sea and Sand Festival at Folly Beach is over. The mad rush has slowed down. Family coming in from out of town to stay with us for a week. But best of all a new painting is started. This time it's going to be large 18x24. A friend of mine is a photographer and he has some beautiful work. I have been inspired by a few of his photographs and he has graciously agreed to allow me to use them as referance material. So deep breaths, my new painting is started, I may not be able to work on it much for a week, but it's started. Plenty of time for sketches, though. The wheels are turning and the ideas are flowing. Now just to get them sketched out so I will have them when this one is done. I have been busy in my studio, with watercolors! I put them down several years ago, frustrated and agrivated. At the time I was working 40 plus hours a week and couldn't invest the time I needed into them. cause of my frustrations. With the supply issue under control, a better understanding of the medium and more time to invest in painting. I have been busy, painting and playing with this "new" venture. When the painting and learning slow down, I will post more. I hope to have more photos of some paintings to show soon. The Bird of Paridise was my class picture, the Hybiscus Flower is one that I have tried many times in the past, They NEVER turned out like this!!!!!!!!!!!!! yea!!! This week has been a little out of sorts, toward the crazy side. Trying to finish projects I've started and get a few things ready for a last minute show opportunity. Well at least most of what I set out to do is done. My son has some of my prints in the "Tides of March" on Folly Beach this weekend, a half way decent business card, my first ACEO's are done, (willl be posted on Facebook, then Etsy). I still have 2 originals I am working on, maybe I can get back to them now that the "maddness" is done. For those who are in the Charleston, SC area, The "Tides of March" event is taking place at the Folly River Park on Folly Beach March 13-14, Satuday 10-4, Sunday 1-4. See my Facebook fan page, become a fan and get the special offer Good only for the "Tides of March". 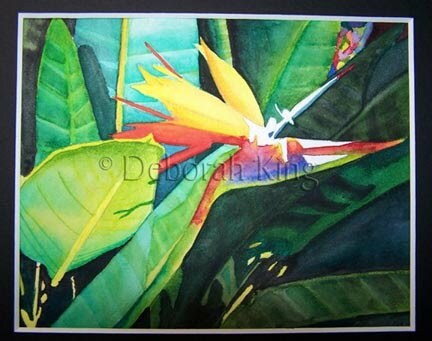 http://www.facebook.com/dksartstudio. 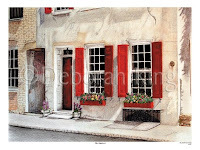 This picture is of a house front in Downtown Charleston, SC. It was done in watercolor paper with color pencil. The original size of this picture is 18"x24". While the original is in a private collection, a limited edition of 500 prints were made. I also have prints in 8"X10", 5"X7", and frameable note cards.